In 1853 the Poet Laureate, Tennyson, decided that he & his family should leave London & relocate to Freshwater, a remote region of the Isle of Wight, believing that here they could enjoy a quiet life away from his admirers. For almost forty years, Tennyson, his wife, Emily, & their sons, Hallam & Lionel, entertained guests at Farringford House. Their friends included the illustrator & author Edward Lear, & the artist Sir John Everett Millais. 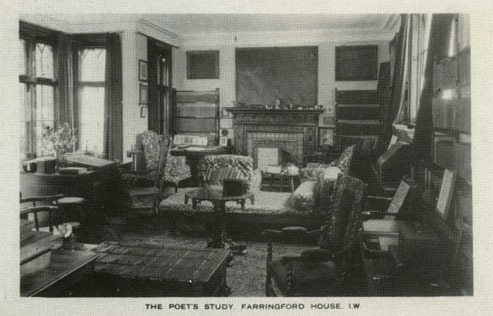 The postcard below shows Tennyson’s study in Farringford House. Farringford House has beautiful views over Freshwater bay & beyond. To retain his privacy from tourists, Tennyson built a rustic bridge (below) over the public footpath that passed through his land. It was to little avail. People collected beneath it in the hope of catching a glimpse of the Laureate hurrying across in his military cloak, with his big hat pulled down over his tangled hair.